Figure 1. A hand-held tympanometer. Acoustic admittance: The degree with which sound waves travel through the eardrum membrane. Acoustic compliance: Synonymous with "acoustic admittance". Compliance: degree with which air travels (i.e. determined by the eardrum and the middle ear system); indicative of the equivalent volume of air in the middle ear. Gradient: refers to the shape or width of the tympanometer curve. Otosclerosis: aberrant bone growth of the middle ear resulting in structural deficit and conductive hearing loss. Pascal (Pa): unit for pressure or stress where 1 Newton/m2 = 1 Pa.
Pressure: refers to the amount of air pressure applied to the ear canal to obtain maximum acoustic or eardrum compliance. Tympanogram: resulting chart obtained when measuring compliance of the eardrum using a tympanometer. Three general types of tympanogram tracings have been described in the literature. A normal ear gives tracing type A as shown in Figure 2 below (a bell-shaped curve with peak admittance occurring at or near 0 daPa). Figure 2. An example of a normal tympanogram graphically charting compliance (C in mL) of the tympanic membrane under changing pressure conditions. The equivalent volume (V in mL) of the outer ear canal, the gradient (G in mL) and the pressure in dekapascal units (P in daPa) at maximum compliance are also given on the right. Tympanometry: measurement of the ability of the eardrum or the middle ear membrane and its associated bones (hammer/malleus, anvil/incus, stirrup/stapes, see Figure 3 below) to transmit sounds in the form of pressure waves. When subjected to changes in air pressure, the intact eardrum stiffness (impedance) and compliance (admittance) characteristics can be thus be determined. Volume: refers to the equivalent volume of the outer ear canal with reference to the volume in the middle ear. In general all mice are acclimated in the procedure room where the tympanometry examinations are conducted. a. Tympanometry is conducted in a quiet animal procedure room. Environmental noise is maintained at a minimum of 50 decibels sound pressure level (dB SPL). b. After performing a comprehensive calibration of the sound level meter and bioacoustic simulator, a mouse is then prepared and given short-term anesthesia intraperitoneally (i.p.). c. Once the mouse is fully anesthetized, it is visually and quickly examined for signs of developmental defects or morphological abnormalities. The external ear canal is checked for cerumen (ear wax) or debris buildup with the use of an otoscope. Any potential obstruction to the ear probe opening is removed including excessive ear wax and hair. d. Also the eardrums may be pre- or re-checked for perforations, to verify aberrant tympanograms, and to rule out the presence of a fluid filled middle ear (see Figure 3 below). 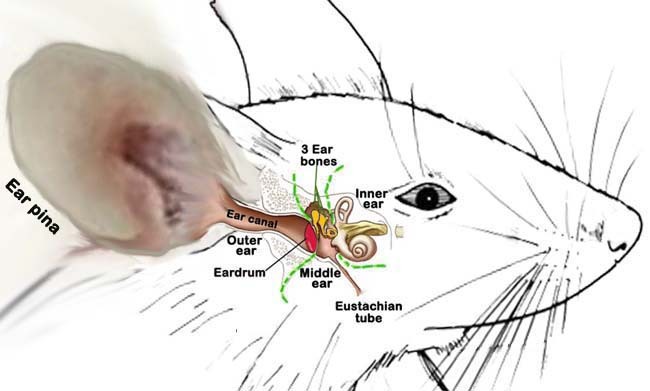 e. The physical volumes (1.5 mL, 0.5 mL, and 0.25 mL) of the tympanometer are checked while the mouse external ear canal volumes (0.05 mL) are actually measured. This is done by filling the external ear canals with warm physiological saline. Actual volume measurements of the mouse external ear canals are expected to be within 30–40% of the tympanometer-readings. In a quite-noise protected procedure room, the mobility of the eardrum is tested using a tympanometer (see Figure 1 above), which applies a small amount of air flow producing a pressure sensation into the ear. a. Proper ear tip selection of suitable size is accomplished before testing and is inserted as far as it will go on the probe tip of the tympanometer. b. For convenience and stable positioning, the probe tip can be detached from the main housing and the properly sized ear tip is inserted into the mouse ear canal making a perfect seal. c. To facilitate a good fitting of the ear tip, the ear pinna or earlobe is pulled out and the ear canal is straightened out during insertion of the ear tip into the ear canal opening (see Figure 4 below). An ear tip covered with petroleum based vaseline may be necessary to obtain a perfect seal, assuring that the opening of the ear tip is not clogged by the sealant or ear wax or obstructed by the wall of the ear canal. Figure 4. 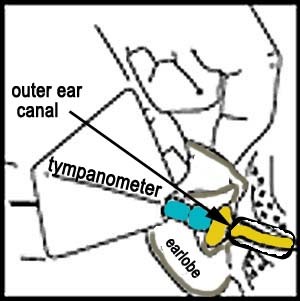 Schematic placement of the tympanometer ear tip within the ear canal opening. d. Once the ear tip is properly inserted and sealed within the ear canal and a fixed and stable position is applied, the test is automatically started. 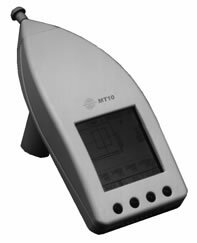 To avoid unwanted movement of the hand, one or two fingers of the hand holding the tympanometer are rested on a fixed-stable surface. e. Selected ear test procedure for normal tympanometry is conducted first in one ear and then repeated in the other ear. 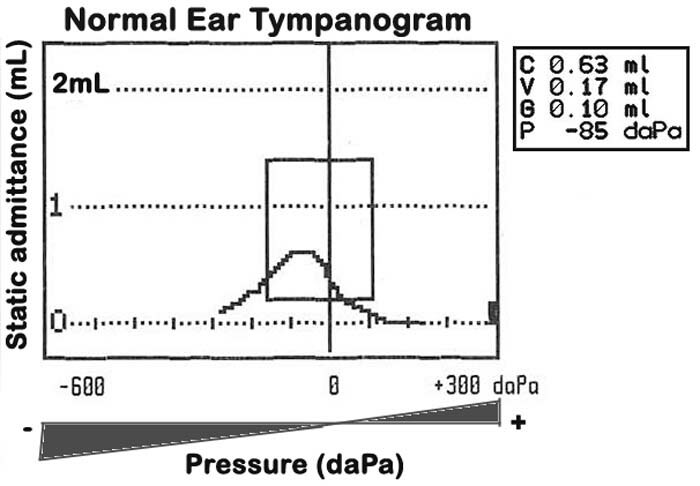 f. After each test, a tympanogram is displayed, graphically charting the tympanic membrane compliance under changing pressure conditions (see Figure 2 above). Tympanometric parameters (compliance, volume, gradient, pressure) are measured at maximum compliance and the tympanograms are interpreted according to manufacturer's guidelines and other clinical validations (i.e. otoscopy, ABR threshold, histology). Tympanometric parameters for both right and left ears: compliance, volume, gradient, and pressure.